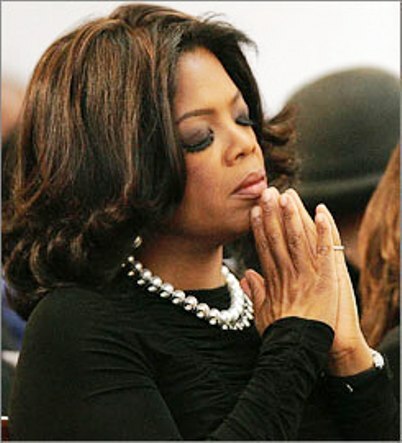 Oprah Winfrey Loses Her Beloved Gracie. Some sad news to report…. Oprah Winfrey’s two year old golden retriever, Gracie, has died. It’s being reported that the cause of death was choking. I would simply die if something like that happened to my dog. On May 26, Gracie choked to death on a plastic ball that belonged to Sophie, Winfrey’s 12-year-old cocker spaniel, while out with her dog walker and two other golden retrievers, Winfrey says. Winfrey (who “stood there dazed, stunned, crying” as Gracie was placed in a golf cart) says she learned this lesson: Enjoy life but remember to slow down, too. Winfrey says she “got the message” to slow down and catch her breath when Gracie died. previous post: Britney Spears Has Done Wigged Out! For Reals Y’all! 51 queries in 1.018 seconds.